Andrew Sullivan has a serious problem. “Trying to explain the doctrine of the Trinity to readers of The New Republic is not easy.” On June 2, 1944, W.H. Auden penned that sentence in a letter to Ursula Niebuhr. On January 26, 2010, Andrew Sullivan posted it as the “quote for the day” on his blog. Displaced and unglossed quotations are always in some way mordant, and bristle smugly with implications. Let us see what this one implies. The striking thing about Auden’s discussion of the Trinity in his piece is that, notwithstanding his complaint about the difficulty of explaining it, he fails to explain it. Instead he concedes that it is inexplicable. “The formula,” he declares, is “a foolishness to the reason,” because reason is convinced only “by logical necessity, like the timeless truths of geometry,” and so could not “grasp … the doctrine of three persons” in God. Auden is not be chided for his failure. He followed in a long line of Christian intellectuals who despaired of explanations for this belief. That line included some of the greatest thinkers in the Christian tradition. Augustine, whose treatment of the Trinity was discussed by Cochrane in his book and by Auden in his review, began his influential treatise on the subject by declaring that the aim of his work was “to guard against the sophistries of those who disdain to begin with faith and are deceived by a crude and perverse love of reason.” Aquinas, in the first part of the Summa Theologica, was more direct: “It is impossible to attain to the knowledge of the Trinity by natural reason.” For this reason, he asserted, “we must not attempt to prove what is of faith, except by authority alone, to those who receive the authority; while as regards others, it suffices to prove that what faith teaches is not impossible.” Indeed, the despair of explanation goes all the way back to the Fathers of the Church, who afflicted themselves with the most extraordinary mental contortions–hypostasis, ousia, and the rest–to make the idea of the Trinity seem plausible. They were right, finally, to call it a mystery. To regard a concept as a mystery may be a spiritual triumph, but it is an intellectual defeat. Of course, my stiff-necked opinion about this central tenet of the Christian faith is not only rational, it is also Jewish. The electrifying history of Jewish-Christian disputations in the Middle Ages amply documents the scrupulously argued Jewish refusal to entertain anything but a perfect unity in the conception of God. In the words of an early modern Jewish writer, whose polemical work survives in an unattributed Hebrew manuscript at the Jewish Theological Seminary, “I do not understand this and you will not be able to explain it to me.” That is not a report of a prejudice. It is a report of a view with rationally defensible grounds. The respect one must have for believers one need not have for beliefs. When Auden joked to Niebuhr that the Trinity could hardly be understood in The New Republic, he was lightly lamenting the spiritual shallowness of the liberalism of his day. He was not alone in this lament, to be sure. The 1940s were the years of the inner deepening of American liberalism, under the influence of Niebuhr, and Schlesinger, and Trilling. Perhaps Sullivan is posting his “quote for the day” to make the same point–except that in his present incarnation he is himself a bizarre kind of liberal, and The New Republic today, a liberal magazine, is not known only, or in some quarters mainly, for its liberalism. It is hard to escape the impression that Sullivan is not liberal-baiting here. No, when he piously implies that the orbit of The New Republic is immune, or hostile, to the eternal verities of Christianity, he is baiting another class of people, and operating in the vicinity of a different canard. Consider some squibs that Sullivan recently posted on his blog. “Most American Jews, of course, retain a respect for learning, compassion for the other, and support for minorities (Jews, for example, are the ethnic group most sympathetic to gay rights),” he declared on January 13. “But the Goldfarb-Krauthammer wing–that celebrates and believes in government torture, endorses the pulverization of Gazans with glee, and wants to attack Iran–is something else. Something much darker.” Michael Goldfarb is the former online editor of The Weekly Standard, about whom the less said, the better. Charles Krauthammer is Charles Krauthammer. I was not aware that they comprise a “wing” of American Jewry, or that American Jewry has “wings.” What sets them apart from their more enlightened brethren is the unacceptability of their politics to Sullivan. That is his criterion for dividing the American Jewish community into good Jews and bad Jews–a practice with a sordid history. As far as I can tell, Krauthammer’s position on torture is owed to a deep and sometimes frantic concern for American security, and his position on the war in Gaza to a deep and sometimes frantic concern for Israeli security, and his position on Iran to a deep and sometime frantic concern for American and Israeli security. Whatever the merits of his views, I do not see that his motives are despicable. Moreover, Krauthammer argues for his views; the premises of his analysis are coldly clear, and may be engaged analytically, and when necessary refuted. Unlike Sullivan, he does not present feelings as ideas. Most important, the grounds of Krauthammer’s opinions are no more to be found in, or reduced to, his Jewishness than the grounds of the contrary opinions–the contentions of dovish Jews who denounce torture, and oppose Israeli abuses in the Gaza war, and insist upon a diplomatic solution to the threat of an Iranian nuclear capability–are to be found in, or reduced to, their Jewishness. All these “wings” are fervent Jews and friends of Israel. There are many “Jewish” answers to these questions. We all want the Torah on our side. And the truth is that the Torah has almost nothing to do with it. Sullivan is hunting for motives, not reasons; for conspiracies, which is the surest sign of a mind’s bankruptcy. These days the self-congratulatory motto above his blog is “Of No Party or Clique,” but in fact Sullivan belongs to the party of Mearsheimer and the clique of Walt (whom he cites frequently and deferentially), to the herd of fearless dissidents who proclaim in all seriousness, without in any way being haunted by the history of such an idea, that Jews control Washington. Sullivan might have a look at the domestic pressures–in lobbies and other forms–upon American diplomacy toward China, Saudi Arabia, Turkey, and Cuba, and give a thought or two to the elaborate and sometimes exasperating nature of foreign-policy-making in a democracy; but he prefers not to dive deep into the substance of anything. It is less immediately satisfying than cursing and linking. Does Sullivan think that Obama’s engagement with Iran–which, accurately described, is an engagement with the Iranian dictatorship and not with the Iranian people–is paying off? Does he believe that the Israeli war against Hamas was an unjust war, or that Israel should have continued to absorb Hamas’s rocket attacks–which were indisputably criminal–and not acted with force against them? His answers may be inferred from his various ejaculations–“the pulverization of Gazans,” for example, is a phrase that is calculatedly indifferent to the wrenching moral and strategic perplexities that are contained in the awful reality of asymmetrical warfare–but they are not so much answers as bar-room retorts; moody explosions of verbal violence; more invective from another American crank. Worst of all, the explanation that Sullivan adopts for almost everything that he does not like about America’s foreign policy, and America’s wars, and America’s role in the world–that it is all the result of the clandestine and cunningly organized power of a single and small ethnic group–has a provenance that should disgust all thinking people. And this is not all that is disgusting about Sullivan’s approach. His assumption, in his outburst about “the Goldfarb-Krauthammer wing,” that every thought that a Jew thinks is a Jewish thought is an anti-Semitic assumption, and a rather classical one. Bigotry has always made representatives of individuals, and discerned the voice of the group in the voice of every one of its members. Is everything that every gay man says a gay statement? I will give an example. On October 15, 2001, when the ruins of the World Trade Center still smoldered, Sullivan published a piece in the Times of London called “A British View of the US Post-September 11.” In this piece he accused Bill Clinton of “appeasement,” and praised George W. Bush for assembling “the ideal team” for a “task” that “cannot be done by airpower alone,” and had kind words for America’s “world hegemony”–the politics changes, the fever remains the same–and also included this unforgettable sentence: “The decadent Left in its enclaves on the coasts is not dead – and may well mount what amounts to a fifth column.” A fifth column! It is a genuinely sinister sentence. I wish to emphasize two features of Sullivan’s comment. The first is that it is an exercise in demonization: it divides the American people into good Americans and bad Americans. The second is that it is in no way an expression of Sullivan’s homosexuality. It must never be said that when Sullivan lauded the bellicosity of Cheney and Rumsfeld–which wing of American Christianity, by the way, shall we blame for them? –he exchanged the company of the good gays for the company of the bad gays. To say that would be homophobic. Here is what such homophobia would look like: Most American homosexuals, of course, retain a respect for art, and compassion for the other, and support for minorities. But the Sullivan-Shmullivan wing of American homosexuality–that celebrates and believes in torture and war, and endorses the pulverization of Afghan villages with glee, and wants to attack any country where Al Qaeda may be found–is something else. Something much darker. Get it? That bit about Sullivan’s love for the Jewish state is poignant, and on behalf of all the good Jews in America I thank him for it, but I am unmoved. This squib is an anthology of banalities and stereotypes. The “arrogance” of Israelis: they are pushy, aren’t they? And the slippery slope from pushiness in Tel Aviv to inhumanity in Jabaliya: it is obvious, isn’t it? “More fundamentalism,” Sullivan says, but there is no such thing as Jewish fundamentalism, and there has been no such thing as Jewish fundamentalism since early Karaism. (He can Google it.) The settlers on the West Bank and the religious fascists in their midst are not fundamentalists. They represent a particular school of interpretation of scriptural and rabbinical authorities–a debatable one and a deplorable one. But they are not fundamentalists. “More Russian immigrant racism”: it is a problem, though in this region there is a lot of xenophobia to go around, which brings us to “contempt for the Muslim world.” For the entirety of the Muslim world, by the entirety of Israeli society? I think not. And does Sullivan have any notion of the magnitude and the virulence of Muslim contempt for the Jewish world? Muslim contempt for Jews does not justify Jewish contempt for Muslims, of course; but nothing justifies Sullivan’s refusal to give the whole picture. “Military adventurism”: about the wars against Hamas and Hezbollah this is an empty and propagandistic phrase. Whatever went awry in those campaigns, and many Israelis and supporters of Israel were quick to condemn it, they were hardly adventures–unless you believe that the lives of Israelis under attack do not have the same moral import as the lives of Arabs under attack, which is what Sullivan’s malicious epithet suggests. It does not answer the question of whether those wars of retaliation were just wars, it simply dismisses the question. Here, too, Sullivan refuses to give the whole picture. “The daily grinding of the Palestinians on the West Bank”: I was in Ramallah recently, and the situation is more complex and even more hopeful. Anyway, the only thing that will save the Palestinians from the occupation–and a less terrible occupation is still an occupation, which is terrible–is political compromise. With the exception of Salam Fayyad and Mahmoud Abbas on his good days, I do not see a Palestinian keenness for compromise. Again, this does not justify the Israeli lack of the same keenness; but again, nothing justifies Sullivan’s refusal to give the whole picture. If “the Netanyahu government has all but declared war on the Obama administration,” it was after the Obama administration had all but declared war on the Netanyahu government. Obama may have been right about Netanyahu–the skepticism about the latter’s willingness to surrender land for a peace that will bring Palestine into being is not exactly fanciful–but Obama failed miserably, and set everything back. Sullivan’s characterization of the recent history is dishonest. 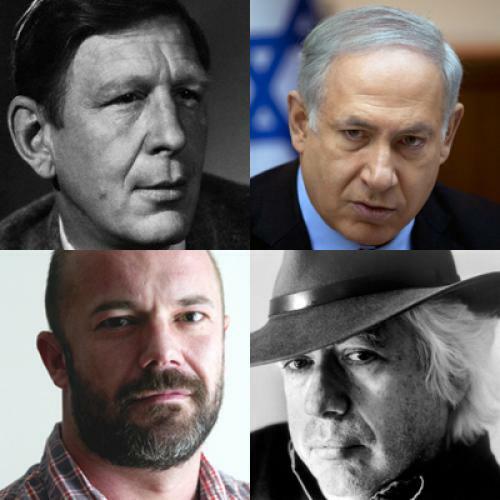 On the other hand, there is no suggestion that Netanyahu is Trig’s dad. And then Sullivan returns to his condescension toward the Jews. Contemporary Israel is “a betrayal of many Jewish virtues.” I thought that human rights, if this is what Sullivan sees Israel abusing, is not a Jewish virtue, or a Christian virtue, or a Muslim virtue, but a human virtue. Israel is a secular state. The primary offense of Israeli brutality in Gaza was not against Maimonides. But Sullivan desperately wants the Jews to be good Jews, to be the best Jews they can be. He wants edifying Jews. Don’t they realize that if they fail to edify, they may lose his friendship? The fools! Jews ought to determine their beliefs and their actions apologetically, so as not to disappoint “goyim like me.” This is a common phenomenon in the experience of minorities. They may awaken to their autonomy, but they must not go too far. Gays are abundantly familiar with this sort of phony friendship, as are blacks. “It does not represent the historic mainstream of liberal Jewish society”: but what if the historic mainstream of Jewish society were conservative? A day does not go by that I do not do my humble part to prevent such a transformation from coming to pass, but let us imagine that it does. What, then? Will they all be bad Jews, and “something much darker”? Is the Jews’ claim upon American understanding premised upon their conformity to a particular politics? Is their legitimacy conditional? Sullivan’s more-in-sorrow-than-in-anger tone is cheap. He can keep his sorrow and he can keep his anger. Sullivan seems unaware that his analysis is nothing more than a digital version of the traditional analysis of Arabists in Washington since 1948, and even before. This analysis is not entirely incorrect: America’s alliance with Israel has often interfered with America’s interests in the Arab world. This is obvious to any student of history. But the American alliance with Israel, like a good deal of American foreign policy, though not these days, was never only an affair of interests. Sullivan is apparently indifferent to the moral dimension of the alliance. On January 6, moaning that he is “sick of the Israelis and the Palestinians,” he noted also that “I’m sick of having a great power like the US being dictated to in the conduct of its own foreign policy by an ally that provides almost no real benefit to the US, and more and more costs.” The high moral dudgeon of the heartless realist: that is quite a trick. Like all of America’s other allies, Israel is a sovereign state, and like all of America’s other allies, it sometimes exercises its sovereignty in ways that baffle or infuriate us; but Sullivan’s patience is wearing thin. “My own view is moving toward supporting a direct American military imposition of a two-state solution,” he wildly announces, “with NATO troops on the borders of the new states of Palestine and Israel.” A new war! Even better, a new war of liberation! Never mind that Israel is a sovereign and a democratic state, and that Palestine is not remotely unified on behalf of such a solution. But at least it would not be a war against a Muslim country. And now that you mention it, isn’t it time that we attacked a Jewish country? It would prove our even-handedness, wouldn’t it? But alas, there’s no way AIPAC will allow it. Having demanded that the Jews behave apologetically in America, Sullivan now demands that the United States behave apologetically in the world–that it adjust its relationship with Israel to the preferences of the Muslim peoples. This is a little like decrying the election of a black president because it will inflame white racists. (Sullivan writes about the “middle” and the “core” in the Muslim world as if they were the independents and the base in Massachusetts.) But peace between Israelis and Palestinians should be made primarily for them and by them. And anti-Americanism, like anti-Semitism and many versions of anti-Zionism, cannot be adequately understood as a response to the actions of Americans, Jews, and Zionists. Prejudice is not an instance of empirical thinking, as the tenacity of anti-Americanism after the election of Barack Obama demonstrates. There is a progressive president in America now, enchanted by “engagement” and by Muslims. In the universe of jihadism, however, this alters nothing. As a matter of numinous conviction, the jihadists are anti-Americans and anti-Semites and anti-Zionists, and their anti-Zionism is a form of anti-Semitism. They do not want to take the Israel-Palestine question off the table, they want to take Israel off the map. Their goals are literal and maximal. Their worldview is unfalsifiable; their “paradigm” does not “shift.” They do not make Sullivan’s distinction between Israel’s existence and Israel’s actions. If the two-state solution were to come into being, the jihadists would consider their job half-done. It is true that peace and Palestine would have a modest and marginal impact upon the reputation of the United States in the Muslim world. But the scale of this impact is too inconsiderable to assure anything that Israel does an important place among the causes of jihadism. It may be “loopy,” as Sullivan says, for Israeli policy to “be bracketed entirely out of that dynamic,” but it is even loopier to include it significantly within it. Jihadism is a violent political theology determined by ideas and fantasies that do not come from America or Israel, and its abhorrence of freedom, materialism, democracy, modernity, and the West exceeds even its abhorrence of Jews. We do not determine who Muslims are, and they are more than their reaction to us. What does Sullivan really know about the origins and the writings of the jihadist tradition? Yet he has an even more brilliant theory of the origins of Muslim anti-Americanism. He accounts for it not only in terms of Israel’s policies, but also in terms of “those who want to brandish Gitmo, embrace torture, and accelerate Israel settlements.” The neocons, once more. They are what stand between America and Muslim adulation. Bad Jews are making bad Muslims! I doubt that even Krauthammer believes that Krauthammer is this important. The neocons have deranged Sullivan. I suppose they must take what victories they can get. This would count as merely a small comic episode in American political anthropology, except that Sullivan’s bitterness crosses the line into something that is neither small nor comic. I will conclude this unpleasantness here, though there are more rants by Sullivan that merit attention. Criticism of Israeli policy, and sympathy for the Palestinians, and support for a two-state solution, do not require, as their condition or their corollary, this intellectual shabbiness, this venomous hostility toward Israel and Jews. I have striven for Israeli-Palestinian reconciliation, and territorial compromise, and two states, for many decades now, but Sullivan’s variety of such right thinking is completely repugnant to me. There are decent and indecent ways to advocate change. About the Jews, is Sullivan a bigot, or is he just moronically insensitive? To me, he looks increasingly like the Buchanan of the left. He is the master, and the prisoner, of the technology of sickly obsession: blogging–and the divine right of bloggers to exempt themselves from the interrogations of editors–is also a method of hounding. Of course, it is impossible to know what is in a man’s heart; but on the basis of what Sullivan has written, I would urge him to search his heart. Such a reckoning would involve more than the “my bad” efficiency of internet introspection. I do not expect to see it. If explaining the Trinity to readers of The New Republic is not easy, imagine how hard it will be to explain all this.